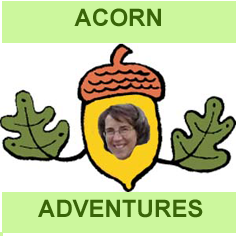 TLGV Ranger Marcy’s Acorn Adventure! Trail Hike and Alpaca Meet & Greet! Join us for Ranger Marcy’s Acorn Adventure, a Trail Hike and Alpaca Meet & Greet, on Sunday, March 20th, 2016 from 1-2:30 pm at Morning Beckons Farm, 343A Sand Dam Rd., Thompson, CT.
Did you know that we have the biggest Alpaca Farm in New England right in The Last Green Valley? Not only will we meet some alpacas, and learn the difference between them and llamas, but this farm has lots of other animals to visit, too. After we meet the animals, we’ll take a walk into the woods on Morning Beckons Farm’s trail to see a pond that is part of the Five Mile River. Did you know that the Air Line Trail connects to the trail we’ll walk on? We’ll show you! No dogs please, since we will be near the farm animals and want to respect them. Snacks, Acorn Adventure stickers and FUN in the fresh air are included! Dress for the weather (bring boots just in case it is wet or mucky), and bring your family & friends! Acorn Adventures are FREE! All ages are welcome. Explore, visit, engage & connect with the things that make our National Heritage Corridor special, like our farms! Note: Park and meet at the farm, 343A Sand Dam Road, Thompson, CT or at the Air Line Trail lot on Sand Dam Road just before the farm. Strollers are ok at the farm, but may be difficult on the trail. We won’t be going too far, so the toddlers should be ok! Visit our Acorn Club online, too!